Six members of Year 6 have had a fantastic opportunity to go sailing on the MarineLake with Mr Jones in Rhyl for the last 5 weeks. The first lesson consisted of getting to know the parts of the sailing boat whereby we also learnt how to use the rudder to steer the boat and how to tack effectively. Tacking is a term used to describe a position and movement of the sailing boat whereby you need to turn the boat from one side of the wind to the other. One thing was practising this out on dry land, but another was actually getting out on the water, keeping balance and doing it for real!! The whole group did super and over the recent few weeks, along with some good practice got to grip with how to accurately steer a sailing boat around the Marine lake independently. The weather is highly influential as year 6 found out but everybody adjusted to the conditions very well. Even Mr Jones managed to have a go but failed to move more than a few metres in 10 minutes… I was powering against a strong wind though... a little more practise needed I think!! At the end of the 5 weeks, everyone successfully completed the course and gained their level 1 sailing certificate. Please take a quick look at our pictures below of our last day sailing! 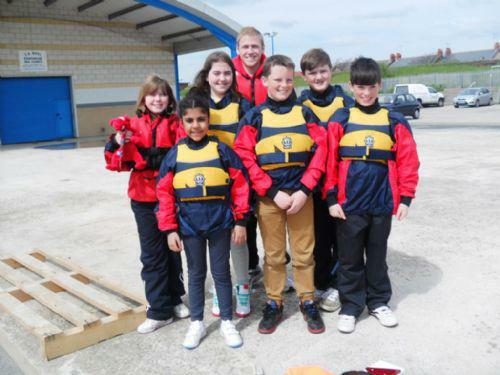 Many thanks go to Rhyl Yacht club for providing these opportunities for us. I am really happy to announce that another 6 pupils from year 6 will also get the opportunity to go sailing in the next 5 weeks, so please keep returning for updates, pictures and news!